The TIS can be used for all standard temperature and process inputs. ERO Australia has introduced a new programmable digital indicator. The 1/8DIN (48x 96mm) panel mounting TIS can be utilised for indication, alarming and isolated signal retransmission of all standard temperature and process inputs signals. A universal input allows for temperature inputs such as thermocouple (J, K, T, L, N, R and S) and Pt100, as well as process inputs such as mV, voltage (0-5V, 0-10V) and the standard 4-20mA and 0-20mA signals. To smooth the input signal and reduce noise, programmable digital filtering is provided. For calibration adjustment, a simple input offset adjustment is available to normalise any displays as required. This allows the one instrument to be used for all standard temperature and process inputs. 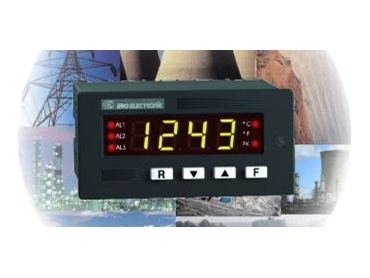 The 4 digit display allows temperatures to be displayed with high accuracy, while process inputs such as 4-20mA can be displayed in real world engineering units. Input signal failures are also detected by the TIS and display to the operator the status of the input as an error message, while a universal mains power supply (100 to 240V ac) or a 24V ac/dc supply allows the TIS to be used in applications worldwide. Up to three independent and fully programmable alarms are available with manual or automatic reset. These alarms can be configured to activate as high or low alarms, with adjustable deadband. Setpoint and deadband adjustment are easily set via the front push buttons. The alarms can also be configured to activate only after the process has reached its operating condition, to eliminate start-up trips. The alarms can be set to set or reset in the alarm condition. Outputs are voltage free relays and front display LED beacons provide clear indication of the alarm status at all times. This beacon flashes when the alarm condition is not present but the alarm is not yet acknowledged for additional operator information. An optional analogue output is also available, and can be programmed to retransmit the input value as a 4-20mA, 0-20mA or 0-10V process signal. This feature eliminates the need for additional external isolation modules, reducing space and cost. The display shows the input value in the required real world engineering units. In addition the display can be set to hold and display the peak high and peak low values. These peaks can be reset at any time using the front buttons, and provide an effective method of analysing the performance of the process limits. An IP65 rated sealing allows the TIS to be installed into harsh industrial environments. The 4 digit display and 4 function button user interface combined with simple setup procedures allow fast commissioning. The simple menu for the TIS provides a convenient and exact method for setting parameters such as new input calibrations and alarms, without the need for simulators and sources. Engineering units such as OC and OF are also shown when selected. The cost-effective, simple-to-use TIS indicating alarm provides a process indication, monitoring and signal retransmission solution for applications in all industrial processes.